Alurateks Bluetooth Audio Receiver with Built-in Microphone is a fantastic way to stream music wirelessly from your computer, smartphone, or tablet to any audio device with an AUX IN (3.5 mm) port such as speaker docks, stereos and car stereos. 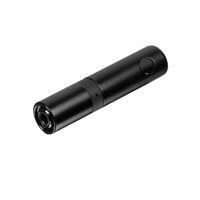 The small cylindrical unit, about the size of a AA battery will Bluetooth enable any speaker or receiver with crystal clear results! Connect AISM01F to your cars auxiliary port to stream Pandora, iTunes or your favorite audio books wirelessly through your cars speakers. The audio receiver features an integrated microphone so you can accept incoming phone calls with hands-free convenience. Easily switch between phone calls and music with the touch of a button. No need to throw out your favorite pair of wired headphones or earbuds. Connect them directly to AISM01F and Bluetooth enable them to enjoy the benefits of cable-free music and audio. AISM01F features Bluetooth v4.1 and a built-in rechargeable battery so you can enjoy wireless audio receiving up to 33 feet for up to 5 hours on a full charge. Charge your receiver via a USB port on your computer with the included USB charging cable.